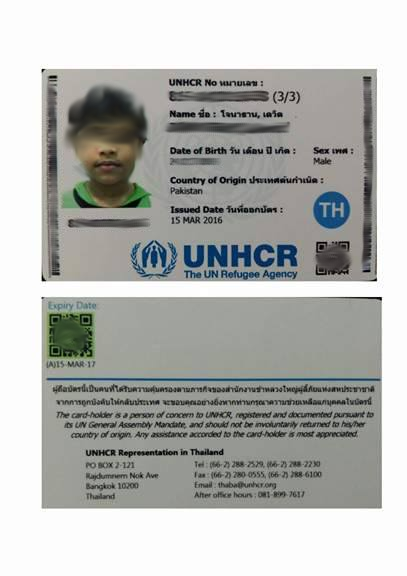 Example of UNHCR ID card. The UNHCR collects these cards from those whose asylum cases are closed. A lot of Pakistani asylum seekers that have been in Bangkok are going back to Pakistan now because they are out of choices. The UNHCR has refused them and then denied their appeal and subsequently closed their cases. If they had been previously detained by Thai immigration and are out on bail then they must return to detention when the UNHCR closes their case. Those returning to detention have generally only two choices: return to Pakistan, or be detained indefinitely. Detention is a serious business and the government doesn’t budge on it. We know of a Vietnamese man who is 16 years now in detention. It’s not likely that any of the Pakistanis would ever be able to leave detention any other way than the only approved route which is to go back to Pakistan. So they are faced with this choice. Live in captivity in the Thai immigration detention center, where currently the men’s room, a space about 10 x 20 meters, houses over 150 men with not enough space for all to lie down so they can sleep at the same time, and where everyone gets sick and there are scabies outbreaks and the like, or return to Pakistan where they could meet up again with their persecutors and be beaten or even killed, and where they have to lay low and constantly look over their shoulder for fear of persecution, and more so if they stay faithful to their faith. The Love Movement is staying in touch with as many families as we can that have gone back. We want to help them survive in Pakistan. We want to form a network of families looking out for each other and supporting each other so no one is battling alone and a support network is just a phone call or instant message text away. These families have a lot to offer and when we support them and we share the Love Movement principles with them and they live by them, then it begins to impact the social fabric of Pakistan in a positive way and it brings positive change – which is the only hope there is in this dire situation.